Prof. Prem Kumar Dhumal, Chief Minister, Himachal Pradesh with Chhatisgarh Chief Minister Sh Raman Singh , Uttrakhand Chief Minister Sh. B. C. Khanduri , Madhya Pradesh Chief Minister Sh. Shiv Raj Singh Chauhan and Gujrat Chief Minister Sh. Narender Modi during NDA meeting in New Delhi .Prof. Prem Kumar Dhumal, Chief Minister said that Central Government was discriminating with Himachal Pradesh in the matter of developmental projects and added that Central Government had not provided any special economic package to the State despite huge outstanding debt of Rs. 22930 crore which had accumulated due to wrong economic policies of the previous congress regime in the State. While addressing the meeting of National Democratic Alliance at New Delhi today, Chief Minister said that Centre had not provided any special economic package to the State despite tough geographical, topographical conditions, economic constraints and high cost of development in hilly region. He said that State had been clearly discriminated in allocating IIT and Central University despite the public announcement made by Union Finance Minister Shri P Chidambaram on behalf of Prime Minister on October 2, 2007 at Shimla. Prof. Dhumal said that discriminatory attitude of successive Congress Governments was in contrast to whatever the State had got from the power projects during the NDA Government led by Shri Atal Behari Vajpayee. He said that gap in demand and supply in power sector could be reduced if UPA Government stopped discrimination with the State and took steps to hand over the central projects running in Himachal Pradesh to the State Government. He said that State Government was vigorously pleading for permission to impose the generation tax on all hydel projects commissioned in the State as per recommendation of Rangarajan Committee report and added that 10 paise tax per unit on power generation can generate annual revenue of Rs. 300 crore per annum in the state but lamented that State Government had not been given approval in this case by the Central Government. Chief Minister told that the first gift of UPA Government to the State after coming into power was to curtail the industrial package from original period of March, 2013 to March, 2007. He said that the package which was first of its kind which Himachal had got in its existence of 50 years was only partially restored till March, 2010 by the UPA Government after BJP raised this issue both within the assembly and outside the House and now even the incentives available for peripheral industries have been withdrawn. He said that the perpetuation of injustice since 1948 during the successive Congress Governments has been carried further by the Congress led UPA. He said that while Central Government provided liberal fiscal incentive package to the industries of North-eastern states on the other hand similar facilities were not extended to the industries of State. He strongly pleaded for restoration of original package upto march 2013 alongwith fiscal incentives at par with North-eastern states. He told that wherever railway lines have been drawn up for State, have remained on paper only and added that the indifferent attitude of UPA Government towards the security related issues of the country is manifested in the lukewarm response towards the suggestions of the State Government. He said that N D A Government had sanctioned Rs. 950 crore cost 8.8 k.m long prestigious underground Rohtang tunnel project to connect the snowbound Lahaul and Pangi valley with all weather road and provide longer connectivity on Manali-Leh highway but this prestigious project had not been started so far due to apathy of the Central Government. He told that although Rs. 1047 crore cost Bhanupalli-Bilaspur-Beri railway line had been declared project of national importance but only token amount of Rs. 30 lakhs had been provided in the railway budget of 2008-09 while the State Government had made a provision of Rs. 37 crore during the Annual Plan of 2008-09. He told that cost of Nangal-Talwara railway line had increased from Rs. 31.04 crore in 1981-82 to Rs. 755 crore in 2007-08 due to slow pace of construction and added that provision of only Rs. 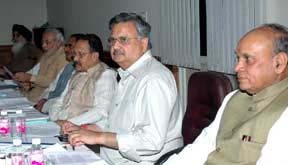 30 crore had been made for the project during 2008-09 as against the provision of Rs. 35.10 crore during the year 2007-08 which showed clear sign of discrimination with NDA ruled States. Prof. Dhumal told that forests was a State’ subject till 1976 and with the shifting of forests to the ‘concurrent list’, there have been a series of steps which have rendered the State Government a mere watchdog of forests without any monetary benefits. He said that State Government is getting practically nothing from the forest wealth of more than Rs. 1.5 lacs crores and added that its scientific exploitation could generate annual revenue of Rs. 1,000 crore to State. He demanded annual central assistance of Rs. 100 crore as compensation for environment conservation and added that water and air quality in north India had vastly improved due to green cover in Himachal Pradesh.